Anthony Crivello, left, portrays Santiago, and Gabriel Florentino, right, plays Manolin in the world premiere production of "The Old Man and the Sea." A fresh take on an American classic is premiering at Point Park University’s new Pittsburgh Playhouse. The latest stage adaptation of Ernest Hemingway's "The Old Man and the Sea" comes from the author’s friend and biographer A.E. Hotchner. It’s the first major production on the mainstage of the new facility and, according to artistic director Ron Lindblom, represents what the theater was designed to accomplish. Students in Point Park’s business school worked on marketing for the show, Lindblom said, alongside communications majors, professional technicians and a Tony Award-winning actor. He said he hopes the collaboration serves as a model for future productions. Lindblom said he was approached by New York City-based RWS Entertainment Group — founded by PPU grad Ryan Stana — and asked to consider the stage adaptation of the Nobel and Pulitzer Prize winning novel. Tackling such a classic, he said, had its challenges. 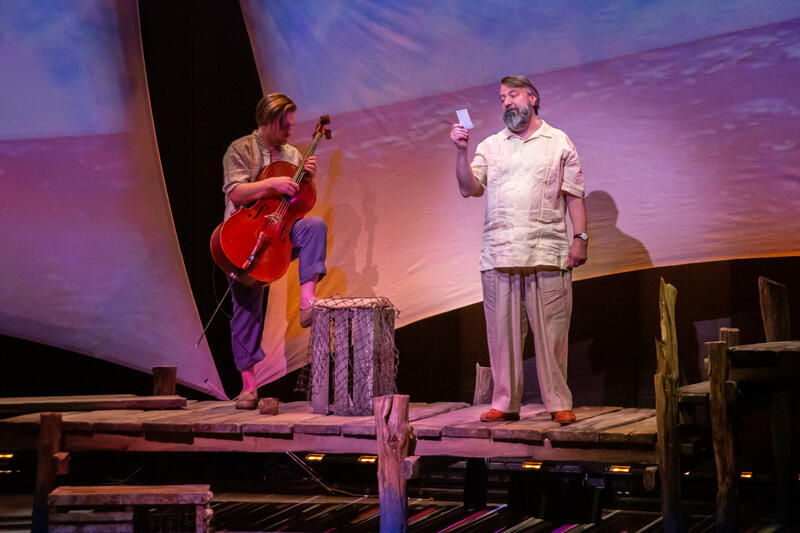 Cellist Simon Cummings, left, and David Cabot, right, who plays Ernest Hemingway in the latest production of "The Old Man and the Sea." The show runs through Feb. 17 at the Pittsburgh Playhouse downtown. “When you’re given this piece and your antagonist is, you know, a 14-foot fish, putting that on stage requires a little bit of imagination, a little bit of creativity,” Lindblom said. Hotchner, who is 101 years old, was involved throughout the production process, Lindblom said, noting that he’d promised Hemingway that he’d someday write a stage version of the story. In this adaptation, Hemingway is a character, rather than a narrator, as has been the case in the movie versions. The Old Man and the Sea runs through Feb. 17.
Who Gets A Break On Property Taxes And Why? Pittsburgh officials continue to discuss how to balance development and protect housing affordability, while legislation to do so has lingered in city council for more than a year. A federal grant may help municipalities in Allegheny County grapple with fallout from last year’s record rainfall and accompanying floods and landslides. However, the competition for funding is fierce, said Matt Brown, chief of Allegheny County Emergency Services. “I don’t think that we’ll have a capacity to recover from a lot of the ... challenges that we have, but this is an opportunity that we don’t want to turn away from,” Brown said.